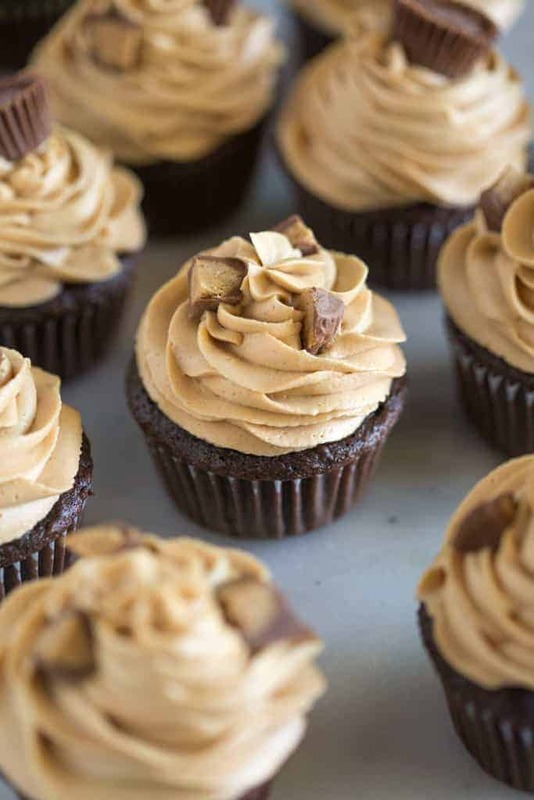 These Reese’s Peanut Butter Cupcakes are always a crowd favorite! 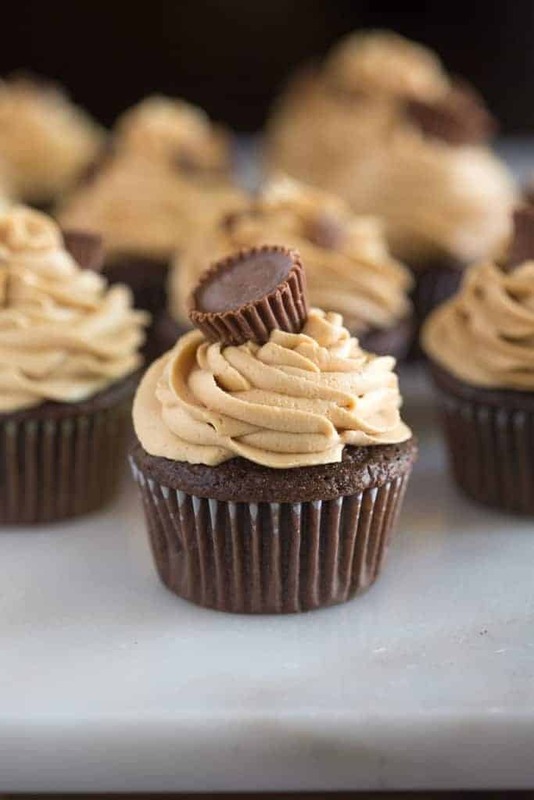 Chocolate cupcakes with peanut butter frosting and a Reese’s chocolate baked in the center. It’s been really difficult writing this post, editing the pictures and getting it ready to share with you guys. It’s been a constant reminder that ALL I WANT is another one! Or two. Or three. I’ve been dreaming of them ever since I made them. Chocolate Cupcakes with Peanut Butter Frosting and a mini Reese’s chocolate baked in the center. BEST CUPCAKES EVER! You can never, ever go wrong with chocolate and peanut butter. Use a standard muffin pan and place a muffin liner in each muffin cup. Fill with chocolate cupcake batter until each liner is half full. Place a Reese’s peanut butter cup in the center of each cup filled with batter. Now your cupcakes are ready to bake! Be sure to allow them to cool completely before frosting. When your guests are ready to eat one they’ll find a happy suprise in the center: a Reese’s chocolate! 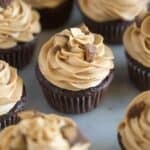 The peanut butter frosting is the really winner with these cupcakes and it couldn’t be easier to make. My biggest tip for making peanut butter frosting is to use a commercial brand of peanut butter, NOT natural or homemade peanut butter! I recommend Skippy of Jif. If you use a different kind of peanut butter you may experience separating, oily or texture issues. 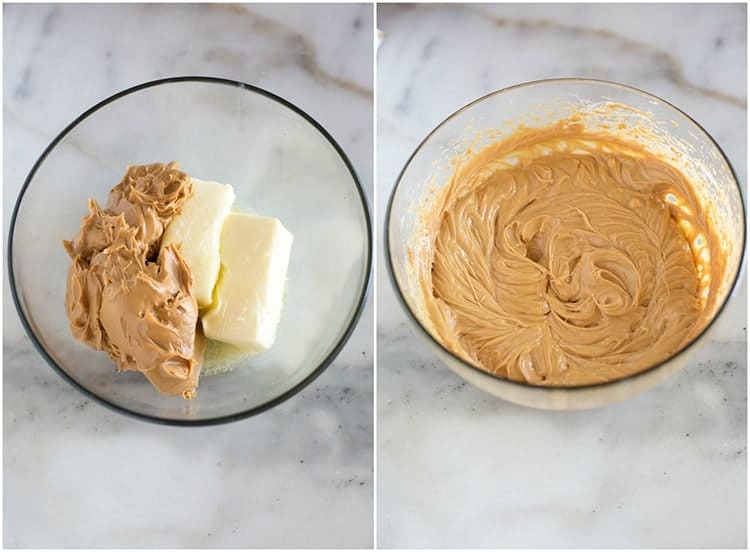 Start by using an electric mixer to mix together the butter and peanut butter until completely smooth. Add the powdered sugar, vanilla and milk and mix again until smooth. The butter/powdered sugar/milk ratio here always yields a perfect thick and smooth frosting for me. If you’d like it a little thicker add a bit more powdered sugar, or if you’d like it thinner, add an extra splash of milk. 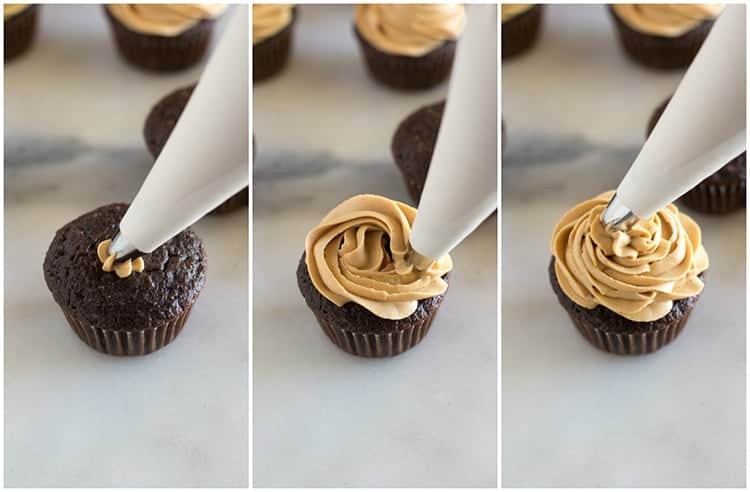 Once the cupcakes have cooled, frost them with the peanut butter frosting. I used a Wilton 1M decorating tip and an Ateco decorating bag to frost these cupcakes, but you could even use a plastic ziplock bag with a small hole snipped from the corner to pipe the frosting on. *Disclaimer….these cupcakes are made using a cake mix (gasp!). Here’s the honest truth. As much as I totally believe in cooking everything from scratch (here’s my favorite homemade chocolate cupcakes recipe) I believe there is a time and a place for boxed cake mixes. I “doctor” cake mixes all the time–I change the add-in’s so that the end result tastes like they’re from scratch! Sometimes you only have 5 minutes to throw together a treat, and the batter for these cupcakes only takes that long! And the best part is no one will ever guess (or care) that you used a cake mix! 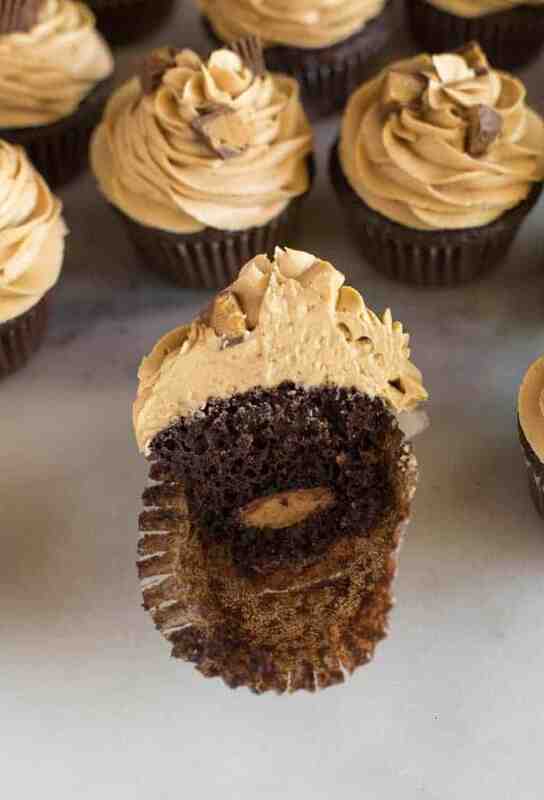 These Reese's Peanut Butter Cupcakes are always a crowd favorite! Chocolate cupcakes with peanut butter frosting and a Reese's chocolate baked in the center. Preheat oven to 350 degrees F. Line 2 regular muffin tins with cupcake liners. Mix together the cake mix, milk, eggs, oil and Greek yogurt until smooth. Spoon batter into cupcake pans, filling the liners 1/2 full. 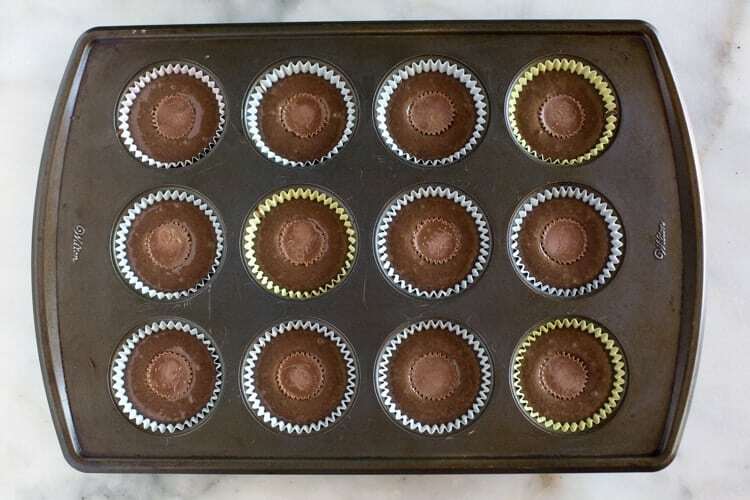 Place a Reese's PB cup into the center of the batter in each cup (it's okay if the the tops of the Reese's are showing, like photo above). Bake cupcakes for 16-20 minutes or until done. Allow to cool completely before frosting. 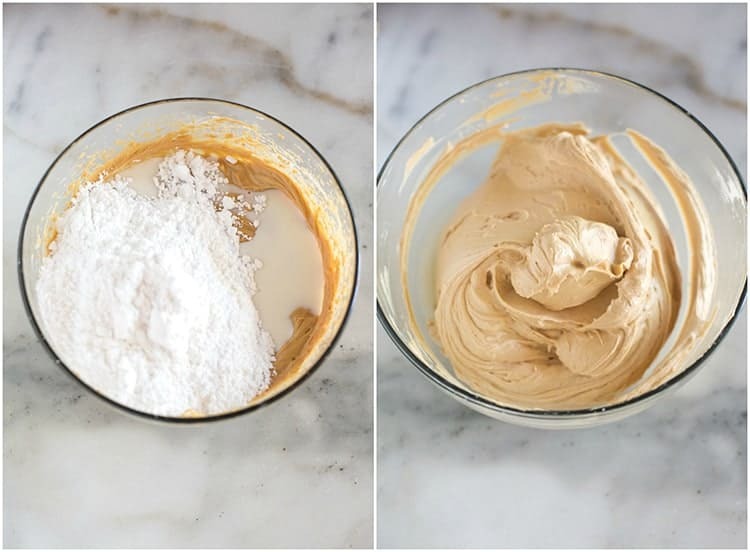 Beat together butter, and peanut butter and mix until smooth. Add powdered sugar and vanilla and beat again until combined. Add milk and mix until light and fluffy. (Add more milk or powdered sugar if needed to make the frosting thicker or thinner). Frost cupcakes (I used a wilton 1M tip in the photos above). Chop up the remaining pieces of Reese's and gently press into frosting. Store leftover cupcakes, covered, in the fridge for 3-4 days. Bake and cool cupcakes 1 day in advance. Keep them covered tightly at room temperature and frost the day of serving. Unfrosted cupcakes can also be frozen up to 2 months. Thaw overnight in the refrigerator and bring to room temperature before frosting and serving. *I originally shared this recipe April 2015. Updated June 2018. Yes, any of those, including regular milk, will work! OMG! These cupcakes are simply amazing! The Peanut Butter frosting is so delicious and the cake is nice and moist! These cupcakes went so fast in our house because they were so scrumptious. We definitely will be making these again! Hello! I was wondering if you could make the peanut butter frosting a day ahead of time and store in the refrigerator? I want to make these for my grandchildren but am using gluten free cake mix by Betty Crocker. Will they turn out ok with all the add ins? I used it and it works! Would rolo’s and caramel work instead of peanut butter? Just curious. To place inside the cupcake? Sure! I need to make a birthday cake. Would there be enough of the frosting to cover a two-layer cake? That’s so strange–have you had problems baking with a cake mix in the past? I’m so sorry they didn’t work for you.